A new review of Mental Health First Aid (MHFA) published in PLoS ONE by researchers in the Centre for Mental Health at the University of Melbourne provides an up-to-date synthesis of the evidence for this public health training program. MHFA was developed in Australia in 2000 to teach community members first-aid skills to support people with mental health problems and has since spread to 22 countries around the world. 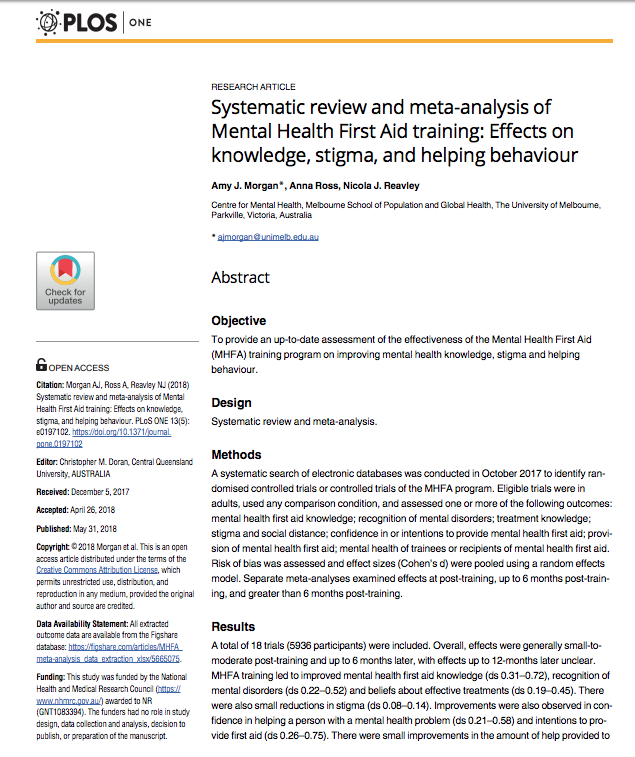 The review supports the effectiveness of MHFA training in improving mental health literacy and appropriate support for those with mental health problems up to 6 months after training. The review pooled results from 18 trials and found positive effects on how to recognise mental health problems in others, knowing what effective treatments are available, and how to support others to receive professional help. “This is the most comprehensive review of Mental Health First Aid training courses currently available. MHFA has a strong evidence-base supporting its effectiveness, which is quite rare for this kind of public health education program”, says lead author Dr Amy Morgan.